Understandable public concern has been expressed about the practice of culling mountain hares and this is perfectly reasonable given the recent coverage in print and social media. So moorland managers are keen to explain more about their work to sustainably manage populations of mountain hares in the Cairngorms and to show that it is not as it is being portrayed in the media. This statement is to try and explain the reality to people who are genuinely concerned or who have a genuine interest in mountain hares. Mountain hare populations move in cycles and they have always been managed by periodic culling when numbers are high. This is still done for the purpose of keeping numbers at a sustainable level, as hares can affect fragile habitats through grazing pressure, can spread sheep tick which also affects red grouse, and can cause the failure of tree-planting schemes. When the population is at a lower point in the cycle, no culling is carried out, that is clear and established practice. Hare populations also fluctuate geographically, so culls are localised. In recent years, the number of hares in parts of the Cairngorms have risen considerably and to levels which have driven the need for properly organised and humane culls, all carried out within the open season. This is done legally and in accordance with best practice, and often also because there is a duty on estates to prevent grazing pressure on rare flora such as juniper and sphagnum moss. Estates would be negligent if they ignored such responsibilities that are placed on them. Culling, as with deer management, is not done on a whim or without good information on populations. Moorland keepers have long experience of managing hares and use a variety of methods of assessing numbers and therefore the appropriate level of sustainable cull. They are usually counted as part of the annual grouse counts in July and can be assessed again visually when they turn white in winter. Culling is a time consuming operation so is only done when deemed necessary because of high populations. Culls on open moorland typically reduce the population by 10-20% maximum. Grouse moors, due to the way they are managed, are the best reservoirs and producers of mountain hares anywhere in the country. But the flip side of that is that they then need to be managed periodically as the population climbs to prevent overgrazing and disease problems. 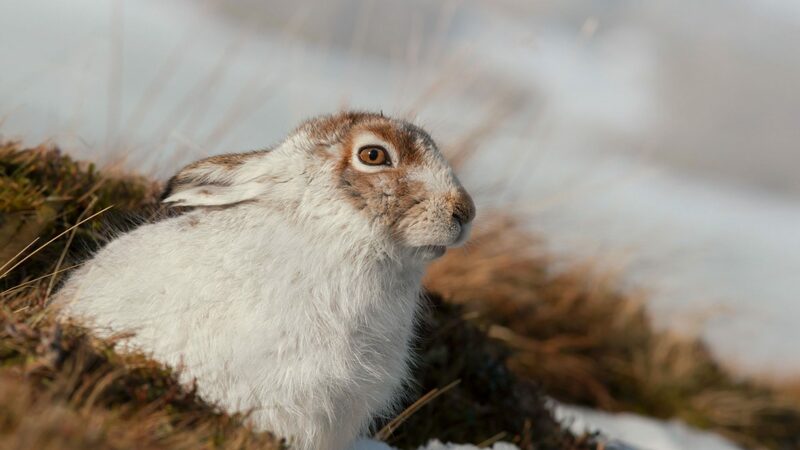 This informed and balanced approach by moorland managers is in contrast to many conservation tree planting schemes across Scotland where mountain hares have to be reduced to almost zero to protect the trees as fencing out hares is ineffective in the snow. Criticism of culls is often made as a result of the basic misunderstanding that if hares are being culled, the population is therefore being wiped out. This is an understandable conclusion given some of the media stories but is simply not true. Comparison between hares seen during the day with the naked eye and at night with special equipment can vary by 5-10 times. Moorland managers value their mountain hares as an important part of the wildlife assemblage, and they are a food source for Golden eagles which are valued on many moorland estates in the Cairngorms. Many estates in the Cairngorms where hare culls have been carried out this year are part of a Scottish Natural Heritage (SNH) funded research project to develop new methods of counting hares, being carried out by the Game and Wildlife Conservation Trust and the James Hutton Institution. Those estates are keen to work with the scientists to continually improve methods and practice and are especially conscious of the need for any culling to be done sustainably. The most efficient and humane method of carrying out a necessary cull is by shooting. This is normally done by experienced estate staff using proper equipment. Culling of hares is certainly not a daily, weekly or regular practice by estates at all. Not least due to the considerable logistics and landscape involved. So it is done in a concentrated and coordinated way, often with a number of contiguous estates collaborating. Numbers culled may be up to few hundred per day, as it is considered most efficient to do it in this concentrated way. But as explained such days are not regular events. If hundreds have been culled, it will only be done in the knowledge that the number of hares left after the cull will still be in the thousands. Essentially, management of hares by culling in this way is no different to managing deer or rabbits. Some conservation bodies and indeed private estates organise significantly large culls of native red deer (Scotland’s most iconic mammal) to reduce their deer numbers to near zero to encourage regeneration and ongoing protection of trees and scrub growth. Perhaps understandable as they are focused mainly on landscape change, but some do question this approach and believe it does not represent sustainable deer management. In contrast moorland managers cull mountain hares to maintain the population at a sustainable level and to conserve the open heather habitat. Voluntary restraint is always being exercised – hares are only culled when numbers are at a high enough level to require it. There is no point in culling hares, or indeed any desire to, if there could be any risk to their conservation status. The most difficult aspect of this debate for moorland managers is that they see the reality on the ground and are rightly proud of the work they do. The moorland is their workplace and they are custodians of it. No proof has ever been put forward to substantiate claims that culls are unsustainable or that populations have been over culled or indeed “wiped out”. Such comments are made by external commentators on the basis of a general hunch but have not been evidenced. In a case last year where such claims were made, moorland mangers on the estate in question immediately hosted a visit from SNH who themselves saw the moorland and hillsides still moving with hares despite claims they had been exterminated.